A sum of 29 bus lines will connect the city of Granada using a easier, less transfer and for all districts lane network from 16 of July. Granada launches on 16 July its new redistribution of public transport getting back to old numbering of lanes to be more convenient, simple and transfer free. Extend LAC line to Chana and Zaidín districts; decrease transfers to the maximum in the city, improve and offer a quality service between different districts is are main axis of changes made on bus lines that will begin next 16 July, and free transfer with Light Rail as well. This is what Mobility Councellor has explained today, Raquel Ruz, who has also detailed that main objective of new rearrange is that granadian people have a more uniform, equitable, easy and intuitive transport network. So, 29 bus lines will connect Granada with this easier network, less transfers to do, and for all districts from Monday 16 July. Main novelties are five primary lines that will get across the city using a simple and intuitive numeration of lines. So, the city will come back to bus line 4 (LAC line extended to Zaidín and Chana districts), line 5, line 8, line 9 and line 33, and also round lines 11 and 21, that will again connect the city center with Camino de Ronda with no transfer. Also, retakes direct connection between the Alhambra and Albaicín with bus line C32. For the Mobility Councellor, Raquel Ruz, main objective to achieve with these changes is to reduce confusion and dissatisfaction created with this current network and its economic effects on the municipal treasure due to the loss of passengers of last years, with a rearrangement created during helped by users of this mean of transport and neighbours in the Municipal District Board and the Mobility Observatory of the City Council.. In this respect, has highlighted the hard work made by municipal technicians incluiding as many viable neighbours and user petitions as possible in the last months, because our priority is to ease everyday life of citizens; using a more convinient where most of displacements will be made using one bus only; and also pretend to connect and attend different districts, the most adversely affected with network implemented by PP. Also, Mobility Councillor has remarked two questions of great importance in this rearrangement: intermodality with Light Rail and a bet for substainability both economical and environmental reducing kilometers travelled, which means less CO2 emmisions. To ease knowledgement of these new lines operative from next 16 July, the City Council of Granada and Transportes Rober through granada.org, movilidadgranada.com and transportesrober.com have expected an informative campaign in different platforms available from today. 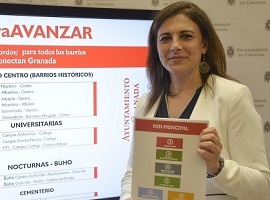 The City Council of Granada will also distribute from 16 July 90,000 bus network pocket maps, in municipal offices, civic centers and Toursim Information Office of the City Council of Granada. Five lines will conform Primary Network from top to top of the city, lines 4, 5, 8, 9 and 33, along with two circular lines: line 11 and 21. First of them, line 4 (now LAC) is one of novelties of this plan that, in the Councellor´s opinon, constituye una de las novedades del plan que, en opinión de la edil, creates more interest for a large number of citizens who live in popular and very populated districts, and located in opposite sides of the city as Chana and Zaidín are.. Final itinerary will be from La Chana through Andalucia Avenue and Sagrada Familia, getting trhough carretera de Málaga towards the city center. Second line in this Primary Network is line 5 (now SN5) that connects Beethoven with Parque Nueva Granada going through Camino de Ronda, Constitución, and Juan Pablo II. This axis gets trhough three important districts: Zaidín, Ronda and North. To this one, there is line 33 (now SN1) that goes from Cenes de la Vega gets to Bus Station, getting through Gran Vía, Constitución and Avda Juan Pablo II; a great axis that join Genil, Centro and North districts. Another novelty is line 8, with head stop in Palacio de Deportes will go through the center and Carretera de Murcia to Casería de Montijo and Parque Nueva Granada directly and no transfer needed. Also, line 9 (now SN3) will go from Rebites to Chana through Recogidas, Camino de Ronda and Andalucía Avenue. This Primary line connects Genil and Chana districts and will have stops in Acera del Darro and at the beginning of Recogidas Street. Again, three districts gets together. Emphasize two new lines in this Primary Network: round lines 11 and 21, in opposite directions. These two new lines response to the needs of Camino de Ronda and Center neighbours whose displacements were a completely mess of transfers, cuyos desplazamientos con el sistema actual se convertían en un auténtico galimatías de transbordos, even being necessary to make two of them sometimes Also line 11 will have stop in Plaza del Carmen to favour trade. Beside these bus lines of Primary Network, this new collective urban transport network proposed by the goverment team has a Complementary Network aimed to give inter- district service, this is, gather adjacent districts and permeabilize them. This network is divided in Supplementary North, with eight lines N; and Supplementary South with three S.
Line N1 Bobadilla-Villarejo reduce its itinerary because it head stop changes from Marín Ocete to Villarejo. Line N3 Cerrillo Maracena-Triunfo will have the same itinerary as now, with two exceptions: elimination of bus stop in Rector Marín Ocete and gets to Triunfo through Constitución, and get close to Center. Some novelties on line N4 Línea N4 Avenida Federico García Lorca-Villarejo-Triunfo that changes its head stop and its itinerary partially. There will be punctual journeys in peak hours from Villareho to approach neighbours to school centers or work places. On the other hand, amplies is itinerary line N5, Modesto Cendoya-Triunfo, that now modifies its head stop in Caleta to get to Triunfo too. Line N6, N8 and N9 won´t have changes, but line 25 (old C6) modifies itinerary from Parque de las Alquerías, sports center We, going through osaleda district to Traumatología. In respect to lines going trhough the south of the city, this is, Genila and Zaidín districts, line S0 amplies its itinerary and from Bola de Oro and Carretera de la Sierra will get to PTS. Its itinerary will go through the trade center of Zaidín district to favour mobility between these two districts. Regarding to line S2 Villa Argaz- Centro, main change is that it do not go through Aviación Roundabout, getting to Acera del Darro directly from Poeta Manuel de Góngora. Lines S1 and S3 dissapear because there are direct bus lines 8, 9 and 4. On one side, lines C, that pretend to connect districts and historic and monumental places in the capital with the City Center, keep their numeration as C lines, although with this new rearrangement proposed by local government, restores line C32. In this section are line C31 Albaicín-Centro, that remains the same and offer a service very important for neighbours, families and workers of this emblematic district that, daily, go to Granada due to work purposes or personal reasons; line C34 that connects Sacromonte and Centro; line C30 Alhambra-Isabel La Católica, aimed for tourists and visitors; and in the end, line C35 Cemetery-Barranco del Abogado-Plaza Isabel La Católica. Line C32, Ruz has explained that it was an iconic line due to its itinerary that, historically has connected the Alhambra with Albaicín, through Gran Vía, a very well known line and rememebered that, is again operative in the city. In the end, three lines U make journeys trhough universitary centers (U1, U2, and U3), as two round night ones (111 y 121) keep their current numeration. Line U1 Campus Aynadamar-Cartuja extends its itinerary and approaches to health center and also changes head stop and line U2, eliminates getting to Triunfo. CEMETERY LINE C7 WILL BE LINE 13 AS BEFORE. Next you can download two PDF files: Description of lines and stops and line network map.